Good Morning Everyone! I hope everyone is doing awesome on this gorgeous summer day!!! I have been on the go go go and have finally found some time to catch up on my travels this summer! 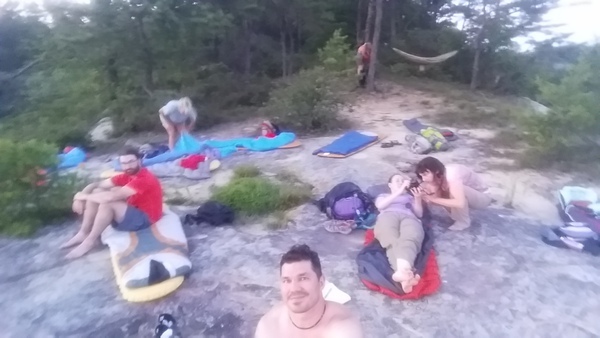 I wanted to spend the summer running and climbing, ya know… chillin’ on the rocks with friends, meeting new climbers and runners. Unfortunately I kept sustaining minor injuries that kept me from doing these awesome things! Sprained ankles, shin splints etc…(I never get rid of a pair of crutches…lol I keep them just in case! Hahaha) So I went back to my other love, backpacking! You get to use hiking poles for stability and hiking boots with great ankle support. 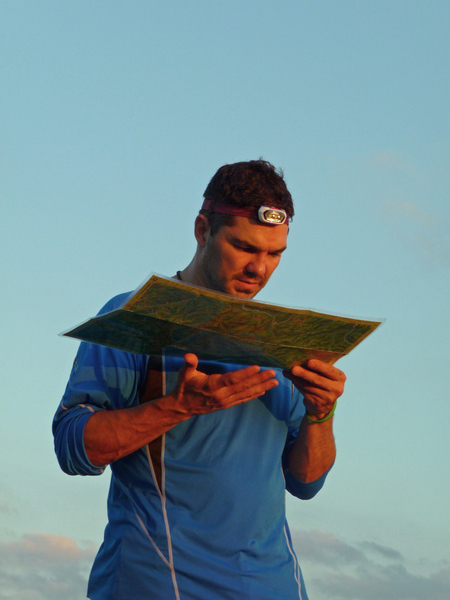 By no means is backpacking considered easy but it is less stressful on the body then trail running and climbing. So backpacking it is! I was able to visit some very cool places this summer! 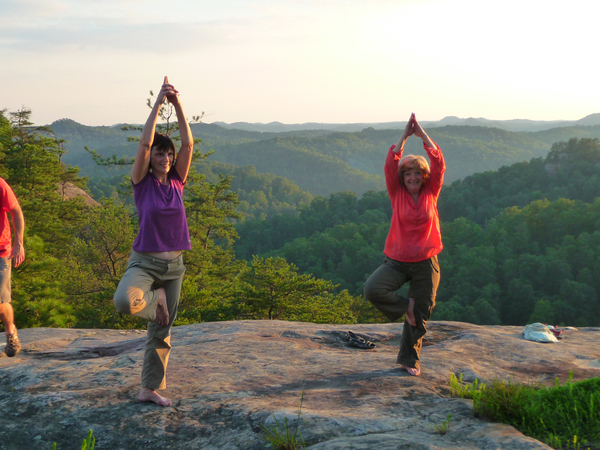 First up The Red River Gorge in Kentucky! I made this a two part post because I couldn’t possibly fit all the greatness that this trip was into a single post! 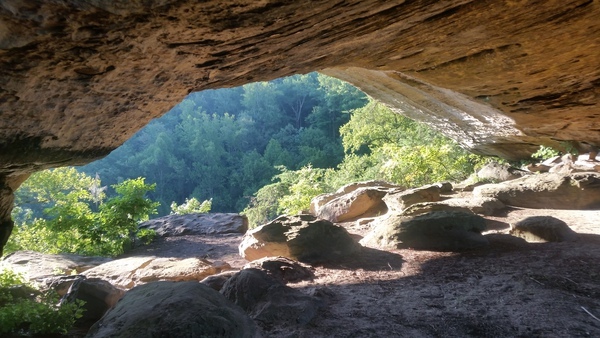 I have been wanting to visit The Red River Gorge for so long and I am soooo happy that my good friend Darwin from the backpacking group decided to put this trip together. 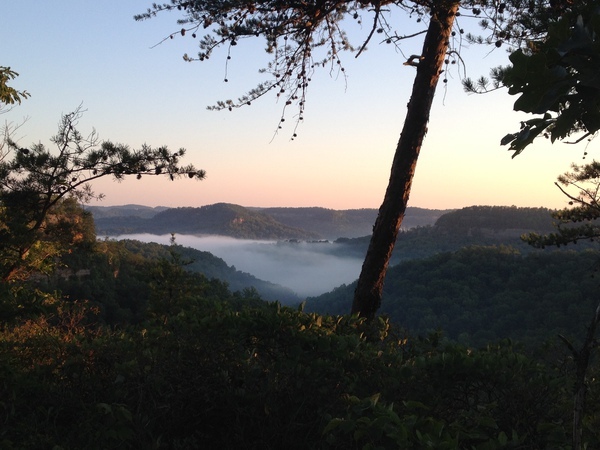 I have driven through Kentucky before but I have never really spent time exploring this great state. It was a trip that was absolutely breathtaking! We started out on Thursday morning and roadtripped 7 hours to the gorge. We had 5 people in the car I was in. Two I already knew and the other 2 people quickly became friends! I think whenever you throw a bunch of people in a car for several hours CRAZY things will be talked about and discussed. Icelandic museums?! We had a great time and quickly got to know one another! There was another car that we caravanned with and they were equally awesome too! When we finally arrived at the gorge we packed and repacked our packs and went on our way. The great thing about this particular trip was that we backpacked out, set up camp and then day hiked. I am soooo happy we did that! Using a day pack instead of a mulit-day backpack made exploring the arches so much easier and we could cover more ground. This trip wasn’t really about mileage. It was about really getting to explore the area we were staying at and we loved it. So when we finished neatly and efficiently packing our packs we started on our merry way. Now I trust my buddy Darwin 110% but even a very experienced backpacker can somehow get off trail. And he did get us off trail..
Darwin stopped to fix is clothes or shoes or something so Matthew, Eliese and I took the lead down the trail that Darwin pointed us in. We were lead right into an in-ground yellow jacket hive!!! Matthew didn’t get stung but I was right behind him and stepped directly onto it! I was stung 6 times, Eliese 2 times!!! 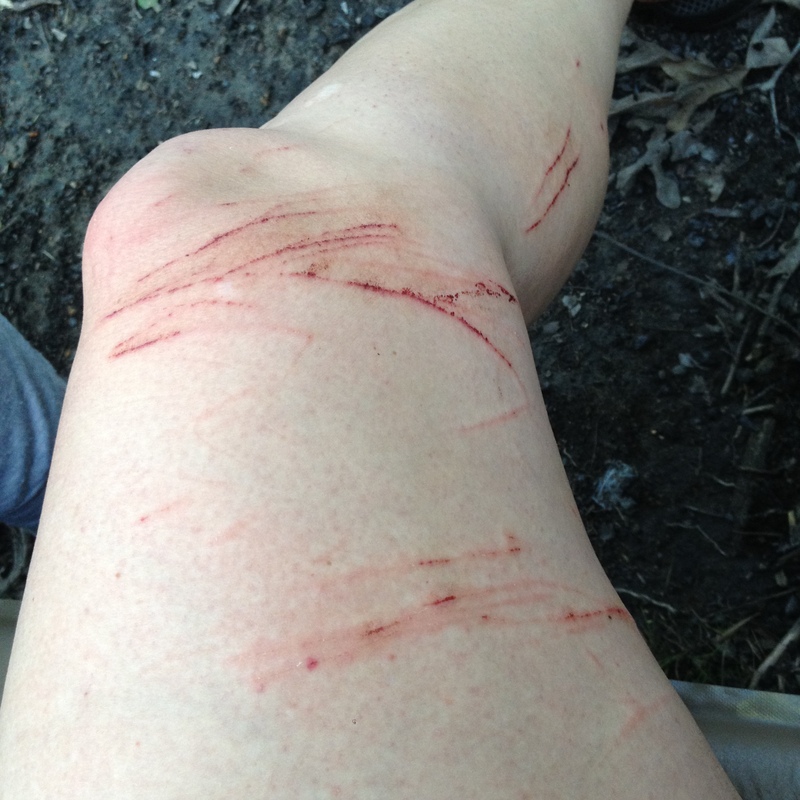 While I was screaming like a banshee I didn’t notice that I ran right into a pricker bush. So this is me post wrong trail/yellow jacket nest courtesy of our fearless leasder…lol..
Later that night a few people went off in search of the sunset. They found a spectacular one but I opted to lick my wounds and stay behind to build the fire along with Eliese as I believe she had had enough for the day too! BUT the next morning I went to greet the sun and this is what I found..
You really have to click on the picture to make it bigger to get the full effect of the spectacular morning…it was AWEsome!!! Those are my two friends Kathy and Melissa who cowgirl camped out on the the ridge. Love those ladies! That night we ALL joined them for a group cowgirl/boy camp. But back to that day! 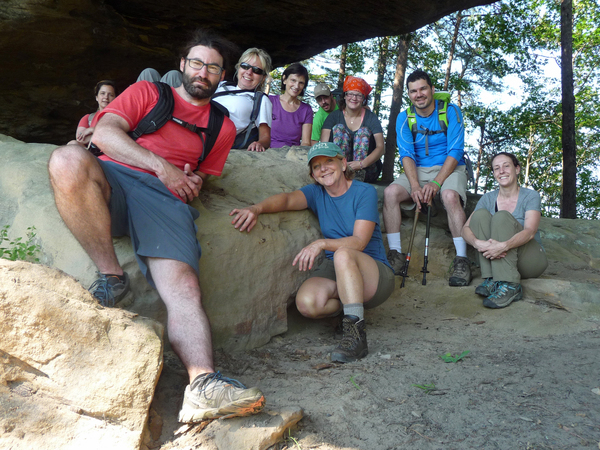 After breakfast we loaded out daypacks with snacks and water and set off to find Star Gap Arch. Darwin actually found it while I was at the ridge and the others were still trying to wake up back at the main camp. We spent a good amount of time exploring the arch and just basking in it’s beauty. Now, the locals won’t tell you too much about the area as they want to keep what isn’t on the official trails sacred. 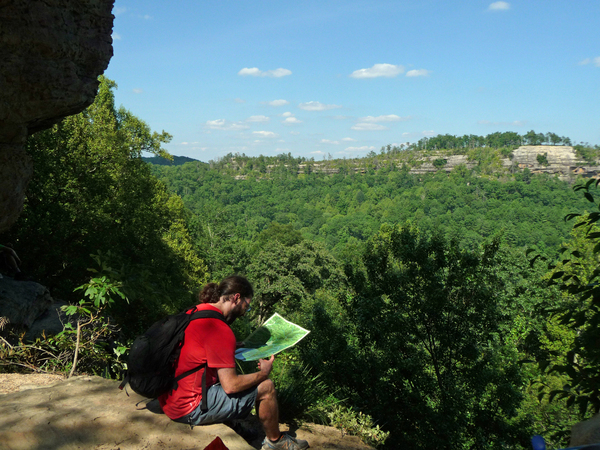 I don’t blame them…but if you do explore the unofficial trails you’ll find even more raw beauty! The Gorge has so much to offer that it is impossible to see it all in just a few days! 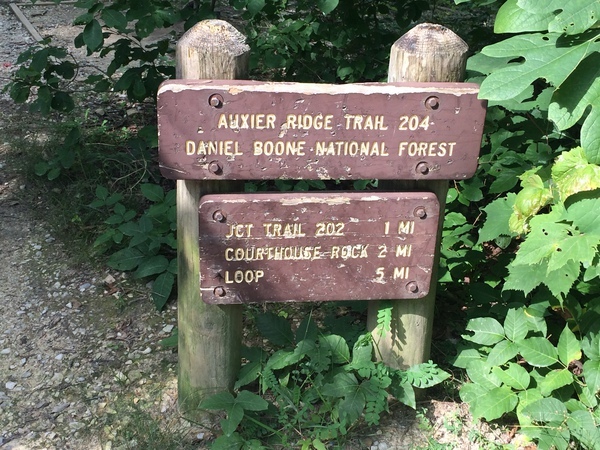 We then went on to Auxier Ridge, Haystack Rock, Wizards Backbone, Courthouse Rock, Auxier Branch (valley), up to Double Arch and then finally back to camp. At one point the heat was just getting to be a bit much. 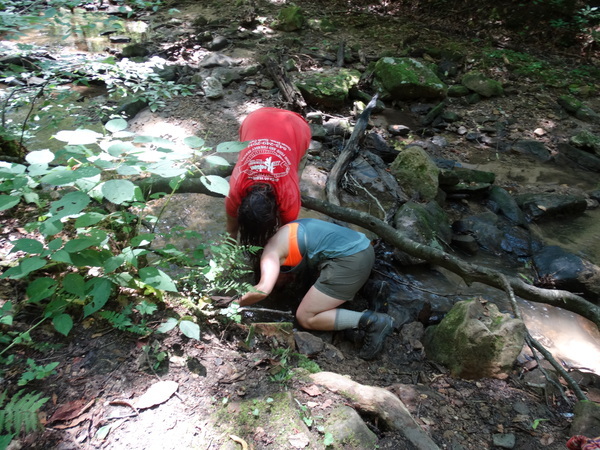 When we stopped to filter water from a small river I took the opportunity to submerse my head and let the cool water flow over my hair and neck! (after everyone was done filtering of coure!) I convinced a couple of the other women to do it too and we all hiked back to camp feeling totally refreshed! It was just what we needed!!! Waking up to sunrises, falling asleep to sunsets. 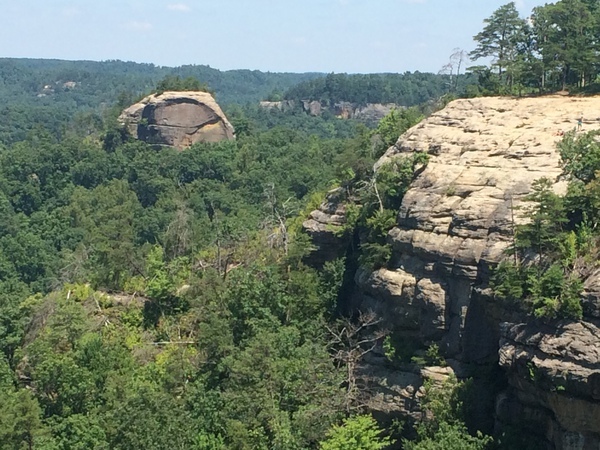 Seeing the majestic valley of the Red River Gorge from the top of a massive rock reminds me of why I put up with spiders, yellow jacket stings, and rattles snakes. Beauty has a price and Mother Nature makes you pay your dues. She is relentless in her ways but she gives what you need to survive and refresh your mind. Stay tuned for Part 2!! Cloud Splitter and Indian Staircase are going to be awesome!! Not to mention jumping off a huge rock and swimming in the river!!! It’s going to be AWESOME!